Instant cameras and photo printers are fun novelty items, and they also make for very good gifts. We recently reviewed one such product, the Fujifilm Instax Mini 9 instant camera, which produces pocket-sized, polaroid-style photos. The camera is good fun to use, but the photos it prints aren’t exactly high-quality, especially if you’re shooting outdoors in daylight. Plus, you’re pretty much stuck with a permanent ‘retro’ look in all your pictures. Today, we’ll be testing another instant solution, HP’s Sprocket. This palm-sized printer was launched in India last month. 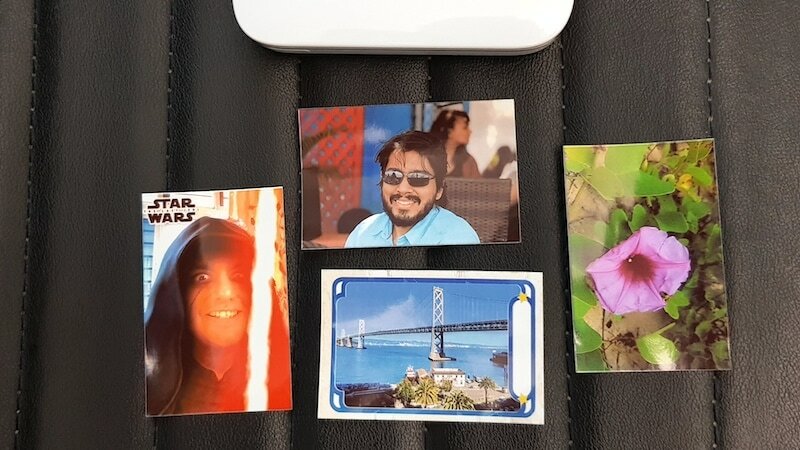 It lets you print 2×3-inch photos from your social media feeds or from your phone’s gallery. Priced at Rs. 8,999, lets see if offers good value. The Sprocket ships in a small box, with just a manual, Micro-USB cable, and a single packet of 10 ZINK printable sheets. It’s available in three colours so you can get one to match your smartphone. The Sprocket measures 116 x 75 x 23mm and weighs 172g, which makes it very pocketable. The body is built primarily of plastic and feels quite sturdy. The glossy finish looks good but picks up hairline scratches very easily. The body has a bronze strip running along its side, with the HP logo and model name in the same colour. The top portion slides open, and this is how you load it with sheets. There’s a single slot in the front from which processed photos are pushed out. Around the back, there’s a lanyard loop, reset pin hole, Micro-USB port, and two LED indicators. The LED to the right of the Micro-USB port glows white when the printer is on and functioning properly, while the one on the left tells you the battery status and glows red when it’s low. There’s only a power button on the side. The HP Sprocket supports Bluetooth 3.0 and NFC (with Android phones) for connectivity and can only be operated through the HP Sprocket app for Android or iOS. The printable paper is provided by ZINK, an independent company that produces zero-ink printable papers. 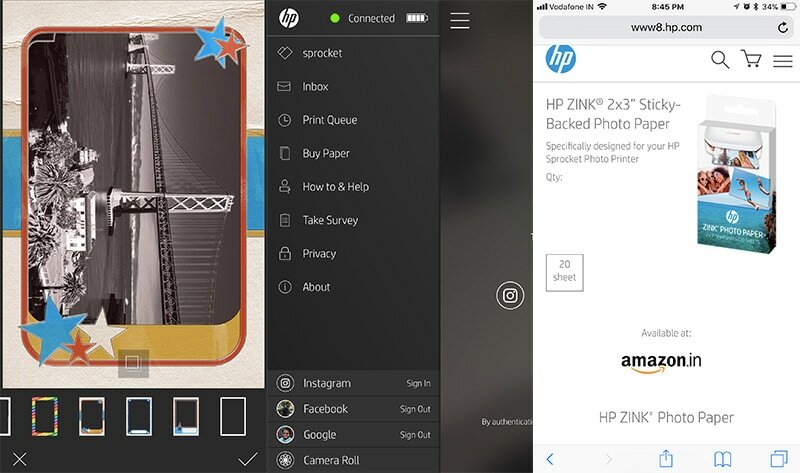 Apart from HP, ZINK has also partnered with other companies including Polaroid and LG, to provide similar paper for their portable printers and instant cameras. The Sprocket works using a thermal process, which means that cyann, magenta, and yellow dyes are already infused into the paper. This negates the need for any sort of ink cartridges or toners in the printer itself. The photo paper is also said to be waterproof, tear, and smudge resistant. Each sheet even has an adhesive back so they can be used as stickers. Charging the Sprocket takes about 90 minutes, after which the status LED turns green to indicate that it’s charged. The ZINK packet has one additional sheet called a Smartsheet, which is a blue paper with some bar codes on it. This needs to be placed at the bottom when loading the stack of papers into the printer. The Smartsheet passes through the printer automatically before the first print job and helps clean and calibrate it so you don’t waste a usable sheet. The Sprocket app is fairly straightforward. It reads most image formats (JPEG, GIF, PNG, BMP, PNG, TIFF) from your phone’s gallery and can also pull images from your Google Photos, Facebook, and Instagram acounts. You can also take photos directly within the Sprocket app. It lets you take either a single photo or switch to Photo Booth mode, in which it takes consecutive shots and aligns them in a grid. Once you’ve shot or selected a photo you wish to print, you can perform basic edits. You can zoom in and crop photos to fit the ZINK-sized frame, auto-adjust the exposure, tweak the white balance and contrast, and also add filters, frames, stickers, or text. Once done, you can save the modified image back to your gallery, share it, or simply go ahead and print it. When the printer is connected and online, you see a little green dot on the printer icon in the app which indicates that it’s ready for printing. You can add images to a queue when the printer is offline, but once online, you can only send one print command at a time. The app also shows you the battery level of the printer. The Sprocket automatically powers off after a few minutes of inactivity, which helps save power. The good part about it being portable is that you can charge it with a power bank if you’re running low. Image quality is decent and certainly better than what you’d typically get out of most instant cameras. HP recommends a minimum resolution of 818×1258 for photos, but even with high-resolution photos taken straight from a DSLR, it’s impossible to get prints to look exactly like the source image. This is more to do with the limitations of thermal printing technology than the printer itself. The ZINK sheets have a fixed density of 313×400 dots per inch, so no matter how high the resolution your source image might be, the final output is limited to the resolution of the paper. The colour tone of the printed photos was always on the warmer side in our samples, and we noted that finer details and skin tones were not reproduced very well. Don’t expect your prints to look like regular photos. When inspected up close, you can see fine horizontal and vertical lines in the prints, and these are most apparent in photos that have fine gradients. We tried adjusting colour tone and brightness to compensate for this but the results were less than satisfactory. There are some fun sticker templates and frames from Disney, which should let you have some fun. The Sprocket gets a bit warm with use, but it never overheated during our review period. Battery life is pretty decent, and we managed to print all 10 of our test sheets on a single charge, with power left to spare. The asking price of the HP Sprocket is a bit on the high side, but considering the cost of the printing sheets, it’s actually a more economical option than the Fujifilm Instax Mini 9. HP is retailing the ZINK sheets on Amazon priced at Rs. 539 for a pack of 20 sheets, which works out to about Rs. 27 per print. If you get the 50-pack, then that will cost you Rs. 1,249, which works out to about Rs. 25 per sheet. This is nearly half the price you’d end up paying for a refill of instant camera film. You get one pack of 10 sheets in the box, which means the printer is good to go as soon as you unpack it, making it a fun gift. The HP Sprocket is targeted mostly at millennials and families, for whom having a physical snapshot of important moments could be important. It’s is a fun device to have around the house, and the app lets you add some neat, creative effects to your photos. You can either pin up your prints, or use them as stickers.